The Toronto Maple Leafs have acquired Jake Muzzin from the Los Angeles Kings in exchange for forward Carl Gundstrom, the rights to unsigned defenceman Sean Durzi and the Leafs' first round pick in 2019. 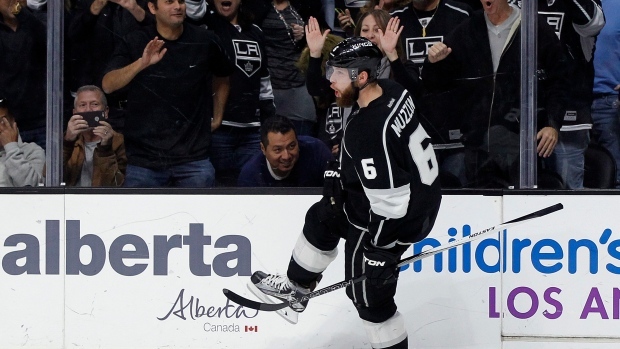 Muzzin, 29, has appeared in 50 games this season, recording four goals and 17 assists for 21 points. In 496 NHL games, he has 213 points (51 goals, 162 assists). He captured the 2014 Stanley Cup as a member of the Kings. Muzzin also represented Team Canada at the 2015 World Championship and the 2016 World Cup, winning gold on both occasions. The 29-year-old has one year left on his five-year deal ($4 million AAV). He is slated to become an unrestricted free agent on July 1, 2020. He was drafted by the Pittsburgh Penguins in the fifth round (141st overall) of the 2007 NHL Draft. Muzzin signed an entry-level contract with the Kings on Jan.4, 2010.